My name is Martin and I have been collected Venom items since the early 80's. At that time me and my friends were always listening to heavy metal music and constant looking for something heavier and faster. We did go from AC/DC, Saxon and Judas Priest to Motörhead and one day we saw this striking cover of Black Metal on an advertisement from Svenska Skivklubben at the backside of the musicmagazine OKEJ. The cover looked awesome and it immediately gave us vibes that this must be fast, heavy and evil. Needless to say, we placed an order. I will always remember that fateful day when the album arrived. With trepidation and excitement I placed the vinyl on my stereo and although the sound was harsh and brutal you knew you were listening to something exciting and new. It was strangely perverse yet deliciously addictive...plus your parents hated it which is a huge bonus for any teenager. After the grating intro of steel on steel (which had you checking your stylus for defects) Cronos invites you to join the band in the worship of "Black Metal". A rip roarer of a song with chainsaw guitars, out of control drums and wolverine vocals it's obvious that this band means serious harm to your health and general well being. From the the first spin I was hooked. What a sound! The image and lyrics made me even more curious. This was definitely my game! From that day and 25 years on, I still can't get enough of this truly amazing band. And during the past few years it has become somewhat of a major hobby in keeping up with and collecting Venom releases (thanks to the possibility from internet). As with all hobbies the collecting grows by month with new items, usually sporting a re-run of back cataloge tracks, or, to bring a warmer glow, a bootleg from one of the bands concerts, better still, a brand new Venom album. While the bootleg may be frowned upon they are very collecttable items which have a gem like quality due to their usually low pressing run. While those who complain so bitterly about them have good reason to do so, the bootleg tends to capture a "Snapshot In Time" of the band, and, for that reason alone they are particulary valid. Venom's back-catalogue has been released in a myriad of different combinations (Calm Before The Storm..anybody! ), and, even though we may already have the tracks, it's all part of the hobby to collect them for their different sleeve or insert designs and also for the simple fact that they are completely different pressing. 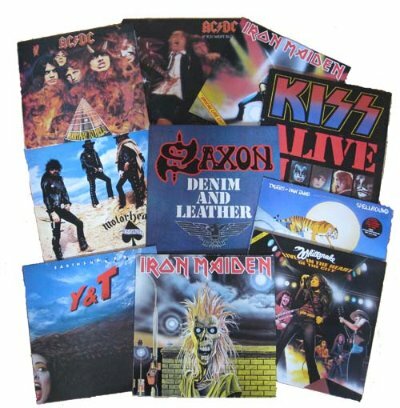 In general, these re.issues have been fairly high standard and are appealing to the new Venom fan as an introduction to the band and also as a collectable to those of us who have been here for just a little longer. Little did I know that my purchase was the beginning of what was to become a fairly good collection of Venom recordings. Little by little other items were bought (At War With Satan), or exchanged - I swapped a copy of The Rods album Let Them Eat Metal for the Roadrunner pressing of Warhead and despite the tasty chick on the Let Them Eat Metal sleeve I have always felt that I got the better deal! When the Manitou single hit the shops that was about the time the ball for Venom collectors really began to roll. Initially it was out on the standard black vinyl, then, the press was emblazoned with "special limited editions". Picture disc, shaped picture disc, cassette single, "12 version. Phooee! What a hype! Yeah, I know, but you had to buy a copy didn't you, had to keep up to date with it all. My anecdotes on collecting Venom releases could go on forever, everything the've released rings bells in the memory of a certain time or place where a particular thing was bought, whether it was a bargain or whether I paid full price. It really doesn't matter does it. If you've surfed into this homepage then I feel sure you must know what Venom are all about. If you're new to the hobby and you look through these page, don't despair, don't think "My God! I'll never get them all!" Well, indeed, you may never get them all, but you can have one hell of a good time trying. Go to the Record Fairs, study the pages of collector magazines, surf the internet 'til your eyes are hanging out. Each time you get your hands on something new you'll get one hell of a kick from it. I know, I've been there and it's great. An exceptional hobby to go hand in hand with an exceptional band. 1. The Songs. Of course. If you want your rock hard, male and adrenaline fulfilled with a hell of a punch Venom fits you perfect.The combination of cement mixer guitars, pneumatic road drill drums and werewolf vocals is indeed mighty. The lyrics are often satanic but humour is always close to hand. Tragically, a small group of Norwegian lunatics mistook Venoms tongue-in-cheek devilry as their cue for church-burning and murder in the early 90's. Nearly every recorded Venomsong have, for lack of other word, great "groove" to them that is extremely different than the black metal band the band would inspire in the future, many of the songs have very sing-along-able courses. You can despite the brutal appropriation always scream along to a Venomsong and that is an important ingridient whenever I listens to diesel smelling hard rock. 2. The Vocals. I can never praise Cronos vocals enough. His voice vibrates with karisma, authority and self-confidence. Cronos has a very likeable voice that fits this kind of in-your-face metal music perfectly. Many classmates in the school of thrash metal that Venom has been conducted ever since have very poor singers whose lyrics in many cases can't be discern. That is a way I don't want my music in bigger doses. In my world Cronos will be sitting in the Heavy Metal Heaven (or should that be Hell..) VIP-room in 30 years together with other heroes like Lemmy Killmister, Toni Iommi and Rob Halford. He definitely belongs there. 3. The Image. Aesthetic and music has always consult together. In the beginning Venom invested quite a lot in the image and as a teenager it was easy to be drawn by Venoms cool album covers, sharp logo, inexorable lyrics, violent attitude, ruthless statement and tough appearance. This clearly contributed to my fascination for the group and there is also no hazard that Venom shirts sells in masses. The "Venom-goat" is along with Motörheads "Snaggeltoth" and Iron Maidens "Eddie" the brightest shining trademark symbol in the world of heavy metal. This is by no mean a complete discography. I know a lot of stuff I don't have, mainly testpressings of Vinyls. The reason I put this website up is to get a chance to share it with other fans and collectors. If you have rare items for sale that is not listed on the site or just have thoughts or questions you are more than welcome to e-mail me. I always take my time to discuss Venom on my spare time.